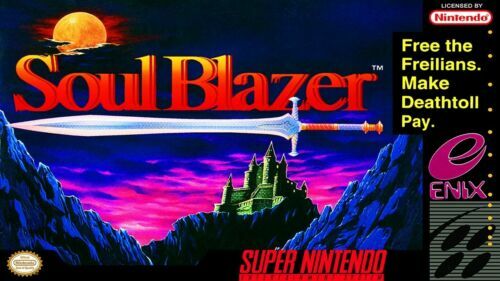 Soul Blazer was developed by Quintet, published by Enix, and released on SNES in 1992. It's an action RPG in which you must defeat monsters and free captive souls. Quintet was actually one of the most prolific developers during the SNES era, and their games are great! Remember Act Raiser, that amazing God sim/action platformer? That was Quintet. Soul Blazer was the second game on the console, the first in a "trilogy," if you will. Quintet somehow managed to release a game every year on the SNES, and the games were pretty good too. If you've played a Quintet game, you know that they like the whole "God/creation/vanquish evil/make the world whole again" theme. And that's on display here as well. You play as the Soul Blazer, tasked by The Master (God) to defeat enemies and thereby restore souls to their rightful owners in towns and villages. There are six areas to free, and once accomplished, you can go to the World of Evil and defeat Deathtoll. The gameplay is a lot like a Zelda game. 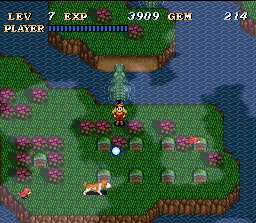 You can attack with your sword and use magic via a sphere that floats around you. Magic attacks use gems, which you can acquire by defeating enemies. Each "world" has a town area and a dungeon area, and you will be travelling back and forth between the two. This is what sets SB apart from your typical action RPGs--there will be times when you have to go back to town to talk to someone so that they open a path or give you an item that will allow you to progress. In order to clear a world, you have to rescue the town chieftan (which is a boss, of course). The protagonist has no personality--the whole point of the game is the characters you interact with, and there are many. This is where the game shines. You get a sense of what these characters are like and the way in which they live. You won't be rescuing just humans, but also animals, plants, mermaids, and even furniture! And then you can go back to talk to them (yes, somehow animals, plants, and furniture can talk in this world). There are also some side quests to do which will get you special items. Taking the time to talk to the characters you rescue is the best part of the game. The environments of the game are varied: cave, jungle, island, snowy mountain, volcano, etc. The dungeons are often large and maze-like. Along the way, you'll find a blue jewel, which will allow you to teleport back to town (very useful). The enemies can be a pain. You have to defeat a certain number of enemies to open a portal, which you then step on to release a soul. There can be a lot of enemies for just one portal! Defeating the same enemy over and over can get tedious and even frustrating. But that's not as bad as the bosses, which are usually too easy or too tedious. But again, you're willing to put up with these inconveniences in order to save the town and talk to the characters. There are also shrines you can enter. Here you can talk directly to The Master, who can save your game or help you move to another area. Sometimes you can find a warp point in a dungeon that leads directly to a shrine. This is useful because just stepping into the shrine will restore all your HP. As you fight enemies, you will also gain levels and your HP bar will increase in size. The music of SB is good, although not a stand-out. The same theme plays for every town, although it changes to a happier mood after the town is completely freed, which I thought was a nice touch. The best music in the game is the dungeons. These are exciting, crunchy themes which make you want to explore. Again, there's not one song in particular that stands out, just good overall. The boss music, however, is very forgettable and is way too short. Don't be deceived by Soul Blazer's simplicity. While the game has you simply defeating monsters and talking to NPCs, there's more to it when you dig deeper. You are saving the world, yes, but you're also restoring families and communities, and you get to see all of that as you talk to the characters of this world. Overall, it's an enjoyable experience, even if it gets tedious from fighting the same enemies over and over again. Don't overlook this gem just because it's not a Zelda or a Final Fantasy. Do you mean the SNES Classic Edition? I fully recommend you buy (it's awesome), and also, Soul Blazer isn't on there (Final Fantasy III is, though). I liked my SNES Classic Edition so much I named it my Game of the Year in 2017! This looks pretty good actually! I love how the bad guy’s name is “Deathtoll.” Ha ha. I really like the colorful graphics. When I was younger and had my SNES for about a year, that Christmas I got two games for it: Super Mario Kart and Soul Blazer. I was initially disappointed at first that Soul Blazer wasn't more like ActRaiser, especially in the music department. 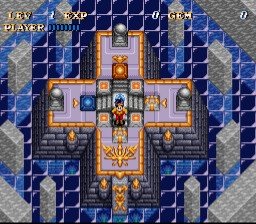 But I quickly grew to enjoy Soul Blazer for what it was. They don't make games like that much anymore. I wish I could've played the other games in the trilogy. But by the time that Illusion of Gaia came out, I was a poor college student and couldn't afford to buy very many games. And us US gamers never got Terranigma, which is a bummer. I think each game in the trilogy is a little better than the last, which doesn't mean that Soul Blazer is bad, but Terranigma is supposed to be really good. I'm hoping to get my hands on it someday. Quintet is long gone but I wonder if Square Enix still owns the rights to these games. A collection of Quintet's SNES games on Switch would be amazing! Yes! That would be wonderful! Their games need more recognition.